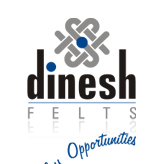 DINFLO from dinesh are 100% synthetic Batt-On-Mesh category of felts in Single Layer base construction. DINFLO which are basically single layer felts, are most suited to long board pickup positions, low and medium speed cultural grade machines with moderate press load with plain presses and on MG positions. Gives fairly uniform pressure distribution. Dewater in the ingoing side of nip.